Surfactants are surface active compound that reduce the interfacial tension between two liquids, or that between a liquid and a solid. Surfactants are organic compound that contain both hydrophobic (head part of the surfactant) and hydrophilic (tail part of the surfactant) moieties. Thus surfactant contains both water insoluble i.e. water repellent group as well as water soluble i.e. water loving group. Biosurfactants are also surface active compound like chemical surfactants but unlike the chemical surfactant, biosurfactant are synthesized by microbes like bacteria, fungi and yeast. Biosurfactants comprise the properties of dropping surface tension, stabilizing emulsions, promoting foaming and are usually non-toxic and biodegradable. Recently interest in biosurfactant has increased because of its diversity, flexibility in operation, and more eco-friendly then chemical surfactant (BS Saharan et al., 2011; Eduardo J. gudi˜na et al., 2011). Biochemical processes of oil degradation carried out by microbes involves several type of enzymatic reactions driven by oxygenase, dehydrogenase and hydroxylase (Hamamura N et al., 2008). These enzymes cause aliphatic and aromatic hydroxidation, oxidative deamination, hydrolysis and other biochemical transformation of original oil substance leading to formation of large number of intermediate degradation products. However, a major limitation of microbial degradation of crude oil is its hyydrophobicity. Biosurfactant produced by oil degrading bacteria facilitate the uptake of crude oil hydrocarbons by bacterial cells and also have low toxicity and high biodegradability (Batista SB et al., 2006). So, crude oil degrading bacteria with the ability to produce biosurfactant is widely recommended for fast degradation of crude oil. (Kumar M et al., 2006). Furthermore possibility of their production on large scale, selectivity, performance under intense conditions and their future applications in environmental fortification also these have been increasingly attracting the attention of the scientific and industrial community. These molecules have a potential to be used in a variety of industries like cosmetics, pharmaceuticals, humectants, food preservative and detergents (BS Saharan et al., 2011). But the production of biosurfactant on industry level is still challenge because of using high costly synthetic media for microbial growth. Biosurfactants are classified on the basis of diversity in their structure and their microbial origin. They contain a hydrophilic group, that contain an acid, peptide cations, or anions, mono-, di- or polysaccharides and a hydrophobic group of unsaturated or saturated hydrocarbon chains or fatty acids. Biosurfactants produced by a variety of microorganisms mainly bacteria, fungi and yeasts are diverse in chemical composition and their nature and the amount depend on the type of microbes producing a particular biosurfactant. Biosurfactants are classified in to two major group one is low molecular weight surface active agent call biosurfactant and high molecular weight substance called bio-emulsifier that is especially used as enhancement of emulsification of hydrocarbon. Further these two major group is divided in to six major group known as glycolipids, lipopolysaccharides, lipoproteins-lipopeptides, phospholipids, hydroxylated and cross linked fatty acids. Mostly biosurfactants are glycolipds. They are lipids with a carbohydrate attached. The connection is by means of either an ether or ester group. Among the glycolipids, the best known are rhamnolipids sophorolipids and trehalolipids. Rhamnolipids is a group of biosurfactant that studied extensively. These are produced by many species of Pseudomonas and have tremendous antimicrobial activity against several common microorganisms, which is an essential property of all cosmetics due to the daily contamination of the product by the human touch (Lourith N et al., 2009). 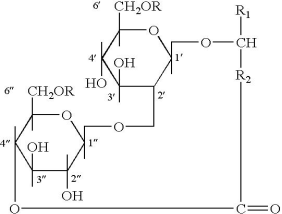 Rhamnolipids is a type of glycolipid biosurfactant that contain either a one or two molecule of β-hydroxydecanoic acid. In 1999 the structure of rhamnolipid produced by P. aeruginosa on mannitol and nepthalene by liquid chromotography was compared. 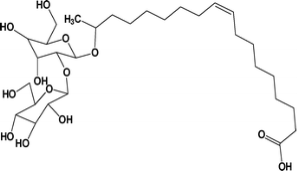 And it was found that for mannitol the most common rhamnolipid contained two rhamnoes and two 3-hydroxydecaonic acid and whereas rhamnolipid produced by nepthalene contained two rhamnoes and one 3-hydroxydecaonic acid. (c) Trehalolipids: It is another type of glycolipids that containing trehalose hydrophobic moieties. Such type of biosurfactant structure is diverse in hydrophobic moieties, varying from short fatty acid to long fatty acid chain. In general it is observed that the bacteria showing Gram’s positive produces Trehalolipids biosurfactant (Anderson RJ et al, 1983). (d) Sophorolipids: Such glycolipids are synthesized by yeast; these are the complex mixture of both free acid and lactone form. The acidic SL contain fatty acid as tail where as SL lactonic are formed by the esterification between carboxylic end of the fatty acid and 4” of the sophorose end. Generally lactonic SL has better surface tension lowering property whereas the acidic SL have better potential to form foam and solubility properties (Nuneza A. et al., 2003). Fig 4: Structure of Sophorolipid lactonized and acid Form. Lipopeptide biosurfactants are cyclic compounds and they are mostly isolated from Bacillus and Pseudomonas type bacteria Lipopeptides mainly consist of hydrophilic peptides, generally they consist 7 and 10 amino acids long, linked to a hydrophobic fatty acid structure. Bacillus cyclic lipopeptides consist of three major groups known as the surfactin, iturin and fengycin families. 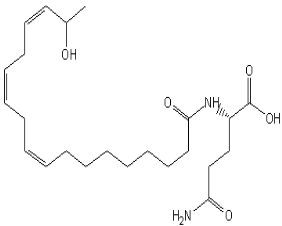 Surfactin is the most commonly studied and it contains 7 amino acid cyclic sequences connected to a C13–C16 fatty acid (Kakinuma A. et al.,1969). Polymeric biosurfactant are high weight molecular biopolymers which consist polysaccharides, proteins, lipopolysaccharides, lipoproteins or mixture of theses biopolymers. A wide variety of microbes produces polymer biosurfactant. Polymer biosurfactant exhibits properties like high viscosity, tensile strength, and resistance to shear. The following are example of different type of polymeric biosurfactant. 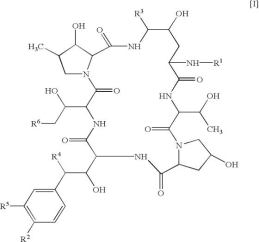 The unique properties of biosurfactant (Microbial Surface Active Agents) such as low toxicity, relative ease of preparation and widespread applicability, make it different from chemical synthetic surfactant and now it has become recently an important product of biotechnology for industrial and medical applications and they allow to replacement of chemical synthetic surfactant. They can be used as emulsifiers, de-emulsifiers, wetting agents, spreading agents, foaming agents, functional food ingredients and detergents in various industrial sectors such as, Petroleum and Petrochemicals, Organic Chemicals, Foods and Beverages, Cosmetics and Pharmaceuticals, Mining and Metallurgy, Agrochemicals and Fertilizers, Environmental Control and Management, and many others. Mycobacterium tuberculosis, Rhodococcus erythropolis, Arthrobacter sp., Nocardia sp., Corynebacterium sp. There are many advantages of biosurfactant as compare to chemically synthesized surfactants. Biodegradability: Easy to biodegradable as compare to the chemical surfactant (Kosari N, 1992). Biocompatibility and digestibility, that allows their application in cosmetics, pharmaceuticals and food seasonings. Easily availability of raw material: The raw material need for production of biosurfactant are easily available, biosurfactant producing microorganism can be isolated from the industrial waste like oil contaminated soil, petrol pump spilled, and also can be isolated from municipal waste. Use in environmental control: Biosurfactants can be efficiently used in handling industrial emulsions, control of oil spills, biodegradation and lowering the toxicity of industrial discharges and in bioremediation of polluted soil. Specificity in their action, since biosurfactant has specific organic functional group and often specific in their action. This is particularly used in lowering the toxicity of the pollutant, used in enhancing the emulsification property, used as raw material in cosmetic, medicinal and foodstuff applications. The crude oil spills are one of the main environmental pollutants. Their abundance and persistence in several polluted environmental areas have been reported (Mohammed M. A., 2004). Oil spillage may be caused by natural disasters like earthquakes in the sea surface or due to accidental leaks during exploration, refining, storage and transportation. The causes can be numerous but the consequences are the same. In case of crude oil, the different types such as heavy or light crude oil can affect the clean-up procedures. Crude oil spreads very rapidly on the sea surface and after a short period of time the thickness of the oil film can be at least 1mm. It is therefore necessary to prevent the spreading to reach the shoreline. Once it reaches the shoreline, it contaminates the soil and cause a great damage to the soil ecosystem as well. Some of the largest oil spills that have taken place all over the world are at Iran, Iraq, Persian Gulf, Uzbekistan, Kuwait, United States, Gulf of Mexico, Pakistan and even in India. The most recent oil spill in India is the spill of ONGC Trunk oil pipeline burst, at Uran, Mumbai on 21st January 2011. Around 40 to 45 metric tons of oil was spilled in Mumbai coast that spread around 4 sq km area. Many such disasters reported one seeping oil from a sinking ship. In August 2010, oil spill at Gopalpur beach Orissa in April 2010 causing the death of many Ridley turtles that breed there during that period. It hence becomes a necessity to clean up this oil in order to save the marine life. Clean-up and recovery of hydrocarbons from an oil spill is difficult and the strategies for cleaning up an oil spill are greatly affected by a variety of factors such as the type of oil spilled, the temperature of the water body, and the types of shorelines and beaches involved. A number of approaches and technologies have been developed for spreading of oil spills in marine shorelines and freshwater environments. Many mechanical and chemical methods can be applied to clean-up the spills (Zhu et al., 2001). Sediment relocation or Surface washing. Although various conventional cleaning methods such as physical methods like the first response selection, rarely achieve complete cleanup of oil spills. According to the Office of Technology Assessment (U.S. Congress, 1991), current mechanical methods typically recover no more than 10-15 percent of the oil after a major spill. Chemical methods are faster in action but they are toxic to the biota present in the spill environment. Bio-surfactants can be used for cleaning of crude oil spillage. Oils are further categorized into three broad groups, according to their molecular weight. General statements can be made for each of the three categories namely light weight, medium weight, and heavy weight components (Scholz et al., 1999). Crude oils are composed of various combinations of these three categories with the following general characteristics. These are components which have carbon atoms ranging from C1 to C10 which are smaller molecules with few numbers of atoms. They are characterized by high volatility, readily dissolvable and evaporate and leave little or no residue because of their short residence time. Many of these components (e.g., benzene, and toluene) are thought to be more bioavailable to animals by primary exposure route (respiratory system). Being highly flammable and readily inhaled, and therefore are of concern for human health and safety. These are components which have carbon atoms ranging from C11 to C22 which have complex molecules. It has low rate of evaporation and dissolves very slowly that take several days with some residue remaining. Not as bioavailable as lower weight components, it is less likely to affect aquatic animals. Its primary exposure route is respiratory system and gets readily absorbed through skin. These are components which have carbon atoms more than C23. It has the longest residence time with very little loss due to evaporation or dissolution. It can cause chronic effect through smothering as residue in the water column and sediments (tarballs, etc). Its primary exposure route is direct topical contact. Some heavy weight components contain carcinogens that are absorbed through the skin. Its risk of exposure is increased due to long residence time, probability of contact, and adsorption property of the oil components. Recently on 21st January 2011, ONGC trunk oil pipeline burst at Uran, Mumbai. 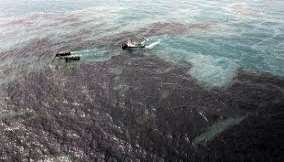 About 40 to 45 metric tons of oil was spilled and spread around 4 sq km area. On 7th August, 2010 a foreign cargo ship, collided with another vessel about 10 km off Mumbai harbor, that spilled the oil in spite of the hectic effect made by Navy and Coast Guard to contain the leak, around 700 tons of fuel oil and 28 tons of diesel oil was spilled. Thousands of eggs of the endangered Olive Ridley Turtles on the beach adjoining river Rushikulya in Ganjam district have failed to hatch this year because of the recent 924 tons of furnace oil spill at a nearby port. Rushikulya Sea turtle protection committee have found that the hatching of the eggs, which ended last week, have gone down by 40 to 50 percent this year as the eggs, numbering thousands, got spoiled after the leaked oil soaked the nesting site on the beach. A number of incidents have been reported happening every year. Some of the oil spill incidents are listed in the Table 2. Oil spills kill wildlife and damage the ecosystem that can last for generations by forcing changes in reproduction and compromising complex food webs. Oil spill damage to the waterways of birds and animals, destroys the animal immune systems, interrupt breeding and fouling of breeding grounds. Besides, they thin bird and turtle egg shells and also damage the fish larvae, causing deformities. They cause damage to sea grass beds and other shelter/feeding areas, tainting of algae, which perform a vital role in waterway ecosystems. Due to oil spill on soil the insects and worms living in it are killed due to hydrocarbon toxicity, lack of oxygen supply and it reduce the pH of the soil. This affects the fertility of soil and its productivity in terms of the growth of plants (Wokocha G.A., 2011). As a result soil eco system is getting disturbed and it effects the plant growth. Soil oil also contaminates ground water and it causes illness to the human beings and animals when consumed. "Biochemical Processes of Oil Degradation." UKEssays.com. 11 2018. All Answers Ltd. 04 2019 <https://www.ukessays.com/essays/chemistry/biochemical-processes-oil-degradation-3431.php?vref=1>. "Biochemical Processes of Oil Degradation." All Answers Ltd. ukessays.com, November 2018. Web. 24 April 2019. <https://www.ukessays.com/essays/chemistry/biochemical-processes-oil-degradation-3431.php?vref=1>. UKEssays. November 2018. Biochemical Processes of Oil Degradation. [online]. Available from: https://www.ukessays.com/essays/chemistry/biochemical-processes-oil-degradation-3431.php?vref=1 [Accessed 24 April 2019]. UKEssays. Biochemical Processes of Oil Degradation [Internet]. November 2018. [Accessed 24 April 2019]; Available from: https://www.ukessays.com/essays/chemistry/biochemical-processes-oil-degradation-3431.php?vref=1.